Twice a year Polo Club Wassenaar organises a starters course for those who wish to learn to play the game of polo. The course involves 4 sessions of two hours and will end with a couple of trainings chukkas with the members. This is a unique opportunity to learn or improve polo ‘riding’, different poloshots, the rules of the game and the tactics on the field. The starting course offers a complete learning cycle of the sport, and prepares the participants to continue the game and take part in the clubchukkas and beginners matches. The number of participants is limited, but you can sign up any time during the season. Times and dates for individual lessons can be arranged at your convenience. The lessons will be geared to your skills and wishes. Horses can be provided. Please contact our polomanager for more details. 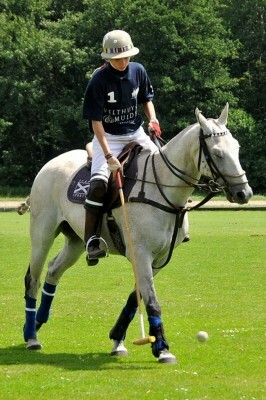 A polo clinic can be organised for groups of at least three persons and involves a two hour program. Starting with a theory explanation and practice shots from chairs, the participants will be mounted on horse back. Subject to individual skills the clinic will be concluded with a match whereby more experienced players will assist both sides. Polo Club Wassenaar organises two types of clinics, both aimed at getting familiar with the game of polo. We organise fixed date clinics for which individual subscription will be accepted, and dedicated clinics for those who wish to sign up as a group of friends or as company event. In this case we will coordinate with you how we shall arrange the program. Horse riding experience is recommended, but not a prerequisite. Cancellation / Liability: Cancellation is possible up to one week prior to the event. After that the full amount will have to be charged. Participants are required to have a valid third party liability insureance. Polo can be a dangerous sport, participation in entirely at the participants risc. Polo Club Wassenaar or its members or staff can not in any way be held liable for accidents, injury or loss of personal property. Participation in any activity at the club automatically means that participants are aware of this and agree to these conditions.